I just got word this is now officially shipping. Find below information copied from the official Kickstarter Campaign. We hope you enjoyed another serious bout of bad acting. It’s our last campaign – we promise. Now, down to the serious stuff. So why are we doing another Kickstarter campaign? Simply put we need your help to continue disrupting this industry! Imagine your life without the headaches and risks of having to make a choice of networks before you have even installed those connected things. No need to just imagine it any longer. Pycom’s back with another world first: This time it’s 5 freaking networks on one small board, the FiPy. We’re so excited about this next new step to making IoT even easier for you all. Whats that ….FiPy? we hear you say. Simply put, we give you a 5 networks in one simple small, perfectly formed, same-foot-print-as-WiPy-and-LoPy hardware module at a price squeezed right down to €33 (early bird) and €49 after Kickstarter. Goodbye “No Service”, Hello Full Control! Get on with a board that gives you full flexibility during testing, install, deployment and even later when you want to switch real-time your airtime network provider. You can switch when the time is right for you or set some parameters that will do so automatically. And then when you are done with all the exploring of what the FiPy can do for you, we bring you fresh new application boards (or shields as some may say) – Pysense and Pytrack to give your IoT applications a real boost. Whether it’s a monitoring, managing or a controlling application, and whether it’s LoRa, Sigfox or cellular LTE-M… or WiFi or Bluetooth you want to use as network, the FiPy does it all for you. Equally, Pymakr and Pymate helps you get up and running fast, in a matter of hours in fact. Enough chatting, get your skates on. Here’s the juicy specs we hope you are now bursting with eagerness to read. FiPy is the IoT development platform of the future (your future?). • All your apps from WiPy, LoPy and SiPy will work on FiPy too. Furthermore, you can mesh-network together ALL your pycom modules eg a LoPy can connect to a FiPy… cool right? Enterprise grade means CE and FCC as a minimum. Network certification is a given for long-lifecycle IoT solutions to ensure stable connectivity. Which LPWAN network will win….? Almost every day you’ll find another article debating their respective technical merits. NOW: Gone are the days of LoRa vs LTE-M vs Sigfox. Here are the days of “I don’t need to chose now, I can choose later so get me going now!”. You can pick from one or several of the 5 networks on the FiiiivePy (sorry, we mean FiPy). An open source LPWAN communications technology that enables low cost private networking as well as shared network deployments . A cellular communications technology that leverages existing infrastructure with potential to roll out at the flick of a switch. Important Note: FiPy will have LTE-M CAT M1 from the onset and NB1 will be delivered as a firmware update during Q2. We are in advanced discussions with various suitable cellular network providers for worldwide deployment. LTE-M CAT M1 and NB1 network operator contenders include Verizon Wireless, AT&T, Vodafone, Proximus, KPN, and Orange. AT&T Mobility Bell Mobility Bermuda Digital Communications China Mobile China Telecom China Unicom Etisalat KDDI Corporation KT Corporation NTT Docomo Orange SingTel Mobile Singapore Telecom Italia Telefónica Telenor Group TeliaSonera Telstra T-Mobile Austria Verizon Wireless Vodafone . Vodafone has said it will launch its first narrowband IoT (for NB1, which is also referred to as Cat-NB1) networks in Germany, Ireland, the Netherlands and Spain in the first quarter of 2017. AT&T switched on North America’s first LTE-M enabled commercial site in San Francisco in October 2016 and is expected to roll out starting in 2017. Verizon will be introducing LTE CAT-M across its network by the end of 2016 . Orange announced that it will implement two new narrowband Internet-of-Things technologies, Narrow Band-IoT(NB-IoT) and LTE-M on its mobile network throughout 2017. Telstra has announced support for Category 1 (Cat 1) devices on its LTE network. Cat 1 will be closely followed by the introduction of both Cat-M technologies. There are lots more activities happening but only a few in the open domain. We will keep everyone posted on progress with each of our parnters as soon as we’re able to. Up to 1km, super long range WiFi is, as you already know, great for all sorts of things and may we say, is your excellent backhaul friend in a nano-gateway scenario. Bluetooth is a short range communications protocol, ideal for wearables and other close range applications. So, when you add all that up, you’ll get to a point where you are probably thinking….MESH. I can mesh that…. and you can! We’ll say no more. Imagine a shield which you can use with any of your Pycom multi-network modules. This is what we give you with Pysense and Pytrack – a leg up to get you off to a great start really quickly. These little fellows fit all Pycom boards and each contain a number of sensors. GPS, GLONASS, Galileo and QZSS. FiPy is compatible with our well-known free open source Pymakr IDE that you would know if you’ve been hacking on WiPy or LoPy. It’s there to help you hack in Micropython, significantly shortening your development time. We reckon you can be up and running, sensing and gathering data within a couple of hours from receiving your pledge…pretty awesome, right? FiPy is also compatible with our one-handed-operations free Pymate mobile app. which is now available for iOS and Android. Within minutes you can see your data and manage your device from your mobile…so cool! Crafted by a group of Pycom back-end experts the Pybytes platform will be everything there needs to be in place to gather, organise and display your data FREE OF CHARGE in the cloud. Regardless of whether you are a company, IoT system architect, or an ambitious tech hobbyist we’ll soon get you connected. Partnership’s like a marriage, right? It’s not just about the looks or the fun we have when things are good. But about our joint value set, how we can help each other grow, a shared vision and aligned culture. Pycom cannot embark on a inventors journey with partners who do not appreciate the value of ‘not settling for compromise’, for whom integrity is just a marketing term and who does not see that creativity for us translates into many skill sets. We are passionate and optimistic – they must be too. Together we make the magic happen, like any good marriage. Espressif ESP32 (WiFi and BLE) Vanguard and from-our-point-of-view PIONEERING, Shanghai based fabless manufacturer of the much acclaimed ESP8266 and now ESP32 chips. Espressif is a close partner and minority investor in Pycom which explains the very intimate working relationship and early arrival of ESP32 based stock with Pycom. Sequans MONARCH (LTE-M) Sequans Communications is another fabless chipmaker and leading provider of 4G and single-mode LTE chipset solutions. Founded in 2003, Sequans has developed and delivered seven generations of 4G technology and its chips are certified and shipping in networks around the world. Semtech Corporation is the home of LoRa. Founded in 1960 with over 1200 employees based in 31 locations. By combining LoRa RF transceiver products with LoRa concentrator gateway, you can create networks with longer ranges and the capacity to handle millions of devices. Texas Instruments. A well-known global semiconductor company operating in 35 countries, Texas Instruments (TI) and Pycom have had a close relationship since our launch with them at CES, Las Vegas Jan 2016. 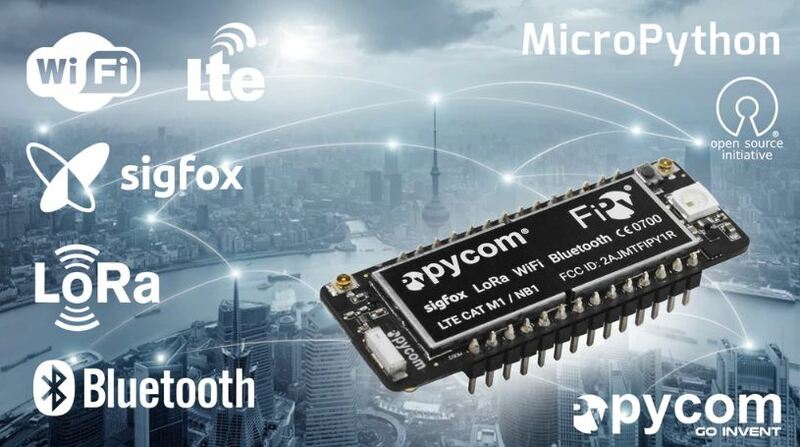 We have had particularly strong support from the Software Development Tools and Low Power Connectivity teams at TI ever since WiPy1.0 and have worked with them to bring the Sigfox integration to SiPy and FiPy. We’re super grateful to everybody helped us get this far. We have an ace team at Pycom, a fantastic community of developers and some great partners to all of whom we are mind-numbingly thankful.